The Devil has a dog, you know. I know he has, because I’ve seen the bridge. I’ve spied the strange bridge-upon-bridge-upon-bridge , 300 feet above the Mynach River, where the little mutt skittered across the stones to join his master for the first time, centuries ago. How the paws must have clattered, somewhere outside Aberystwyth, in an impossibly green vale while the men of the village toiled in the nearby lead mines and highwaymen hid in the cave hidden by the nearby, cascading, tumultuous waterfall. Who builds a bridge on top of a bridge? And who comes along and builds another one on top? And yet there they are, hastily patched one over the other, the route for the old rattling carriages which took ore from the mines. There are two conflicting stories about who built the first bridge. One story attributes the bridge to Heaven, and the other to Hell. The heavenly tale says Cistercian monks built it, stone by stone, across the river in the 1100s. The hellish one, like someone who has made a faux pas at a dinner party, blames the dog. 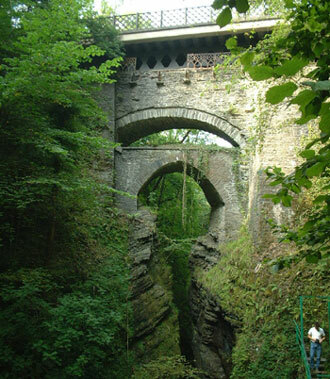 The bridge is called, in Welsh, Pont-y-gwr-Drwy; or Bridge of the Evil One. Once upon a time, a long long time ago, there was this old woman. And you know how old women are for making pacts with the devil. Old women lose their first bloom and gain an unsettling knowing, a ravishing wisdom flowing deep beneath the surface, and of course they consider and weigh every offer. This particular old woman was wise, and wily too; and she knew deep in her marrow that, though her skin was wrinkled and her figure sagging, she could outwit the Prince of Darkness himself. She had this cow. And it was thin and bony because it could not reach the lush pasture on the other side of the Mynach as it carved its way through the crevice hundreds of feet below. So she conjured up the Prince. It’s not difficult to do; but you have to know what you are doing because Satan is adept at ensuring your invitation backfires on you. Evil incarnate sat in the rocking chair and rocked back and forth, savouring his next move. Satan smirked. The first animal was bound to be the cow, and he fancied roast beef for supper. And so with a flick of his princely wrist he fashioned a sturdy bridge. And watched, as the cow turned and began to lumber towards the green grass on the other side. But the old woman took in her hand a great and fearsome weapon indeed: a bread roll. And not today’s but yesterday’s. For she knew every player in this story and each one’s motives. And suddenly, with a great joyous shout, she hurled the bread roll across the bridge to the other side. Through the air it arced, and a keen nose picked up both its content and its trajectory. And the small hairy terrier who lived with the woman positively flew across the bridge, to his new life as the mutt who belonged to Lucifer himself. He was not unhappy; Satan was firm but fair, and was not inclined to be beastly to this lowliest of beasts. But the woman had miscalculated. For she may have gained a well-fed cow, and meals on the table for the duration of the cow’s life. But she had lost her constant companion. Since her house crumbled they built another stone bridge in 1753, and an iron one in 1901. I expect it has taken many terriers in its time. But none as momentous as that first little soul who followed a bread roll all the way to Hades. Posted in Folk talesTagged Devil's Bridge, dog. folklore, Pont-y-gwr-Drwy, terrier, WalesBookmark the permalink. It will have its own story just as compelling, TT. Thank you! Ah, it’s those unintended consequences that get us every time! I’ve outsmarted myself on more than one occasion, proving myself clever but not wise! Great tale. And an impressive bridge! I love it, Debra. It’s a one-off! two trains of thought from this. when women are no longer driven by hormones, they stop falling for the wiley plans of men. Two very valuable strands, Sidey. It’s good to be free of the hormone thing. I hope you do too, Tandy. They are spectacular. Another well told tale and a great way to think about spanning my day here, Kate. The Welsh tales always offer lots of food for thought, Penny. I’d come across versions of this legend before, of course, but this is my favourite! All re-tellings of legends take on the aura of the one telling the tale, and this is just so vivid. For those who have never been there, the situation is certainly dramatic and the views, even on a dull day, spectacular; the latter are free, whereas there are admission charges for the walks down from the road. I had a feeling you’d know this one well, Chris. So pleased you throught the tale compared well. It’s a bit of a nerve, me taking on those old Welsh bards. I assume since the terrier became the devil’s new pet, he achieved immortality, thus outsmarting the old lady and her cow. Do immortals eat bread rolls? Poor little dog! And all for a moldy dinner roll. A Jazz bridge. It has a ring to it, Andra. Now a piece of meat I could see, but do dogs really like to eat bread? Being a practical soul, I would have thrown bread crumbs on the bridge and waited for the nearest bird to come and collect. Or does that not count as “crossing” the bridge? Nevertheless, an absorbing tale and wonderfully told, as always. Jennifer, Macaulay would eat most things if they were decomposed enough. We have encountered him, unable to open his mouth because his teeth were stuck in a bread roll. LOL. What a picture that must be! That was a very entertaining lunch break tale over here, Kate. It made me think of Macaulay hot footing after a stale roll, too. The image fits him like a well-cut suit, doesn’t it, Lame? An enthralling tale, and that old duck deserved to lose her canine companion. Her sense of values was all awry, wasn’t it? btw – I think the Welsh road planners need their heads examined for not making every effort to put their stupid modern bridge out of sight of that fascinating double. That top road bridge looks fairly modern? It is. Early 20th century. Fantastic tale to match that fascinating bridge. Thanks, Kate. Fascinating multi-bridge. I’ve never seen such a thing. Sorry to hear about the terrier though. I’d have probably given up the cow — an emotional, not logical decision. I’m with you there, P. I could never have parted with my terrier. I know a terrier who wouldn’t stir for a bread roll… No legends around here!